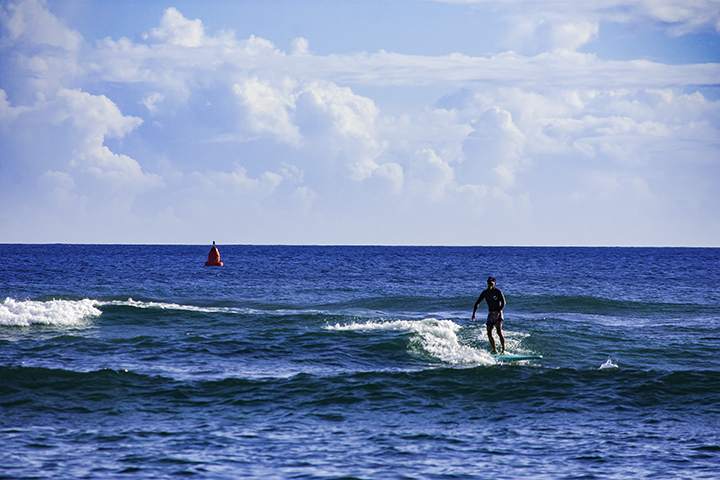 Paddleboarding, one of the increasingly popular things to do on Oahu. There just may be too many things to do Oahu. So we’ve compiled a quick glance of some of the top things to do on Oahu. Use the categories below to get an idea about what kind of events and adventures you are looking for. Whatever you decide to do on Oahu is certain to be time well spent. Going to the beach is probably one of the top things to do on Oahu. Waikiki Beach is one of the most well-known beaches in the world. Waikiki Beach is perfect for families who want to enjoy sun bathing, swimming and a wide variety of ocean sports. Plus, such activities are all within comfortable walking-distance from your hotel. Moreover, there are plenty of other fantastic places on Oahu to enjoy the beach. 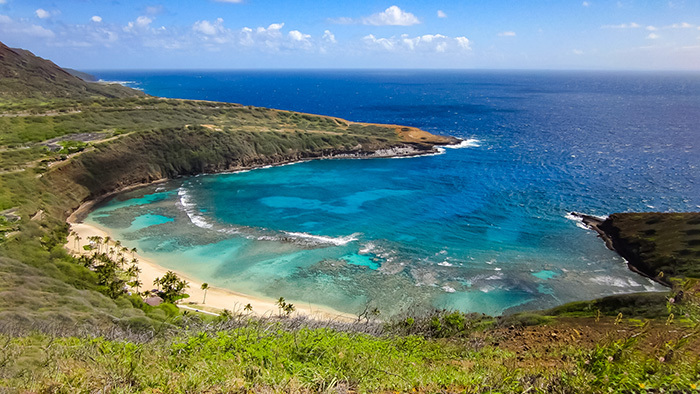 Hanauma Bay is one of the best places to snorkel and to admire reef fish and marine life. On the North Shore, Waimea Bay is a great place to swim when the waves are not pumping. Many consider Kailua Beach on Windward Oahu one of the best places in America to swim and surf. History lovers will have their hands full trying to decide what they can see or do on Oahu. And once you do,you’ll find out why Oahu is a great place to soak in Hawaii’s unique culture and history. Iolani Palace was the home of Hawaii’s past kings and queens. It is the only royal palace in the United States. World War II buffs would enjoy the historic ships, memorabilia and exhibits at Pearl Harbor. Visiting the USS Arizona Memorial is definitely one of the top things to do on Oahu. While there, you can also see the historic USS Missouri battleship, the Pacific Aviation Museum and the USS Bowfin submarine. Plant lovers can wander through the blooming footpaths of Foster Botanical Garden in downtown Honolulu. It is the oldest garden in Hawaii featuring some of the world’s most ancient plants. No trip to Oahu is complete without spending a day at the Polynesian Cultural Center. Here, Hawaiian, Fijian, Tahitian, Samoan and Tongan cultures are represented in unforgettable ways. Visitors can feast their eyes on genuine Polynesian villages. Learn how to make authentic crafts. Watch hula performances and enjoy one of the best luaus in Hawaii. Visit the Bishop Museum in Kalihi. 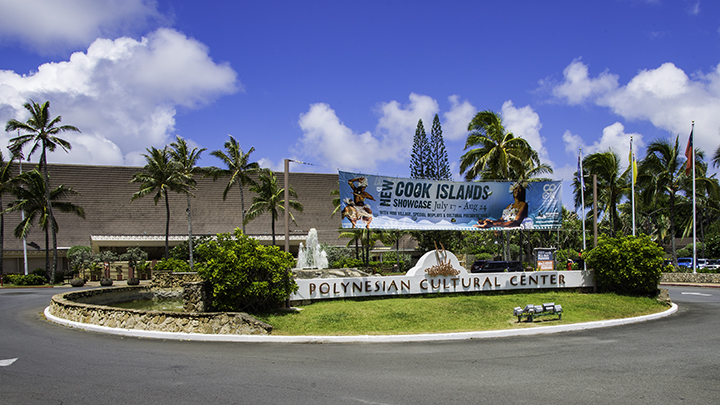 It is Aloha State’s largest museum displaying artifacts and cultural exhibits of Hawaii’s past. Oahu has great food, music and culture. Wander through Honolulu’s Chinatown District to see and eat food from the Asia-Pacific basin. Another great place for locally sourced products is the Kapiolani Community College Farmers’ Market. Here, you’ll find Hawaii’s most vibrant homemade foods, produce and crafts. Take a helicopter ride from companies such as Blue Hawaiian Helicopters or Makani Kai Helicopters. By doing so, you’ll experience some of the most expansive views of the island. More interested in land-tours? If so, here is a small sample of the many options. The Hawaii Jeep Tours offer on and off road experiences on the island. While the all-encompassing Circle Island Tour will give you a glimpse of all corners of Oahu. Enjoy ocean life? If so, there is the Hawaii Reef Aquarium at Sea Life Park in Waimanalo. It showcases over 2,000 sea creatures. Another popular choice is The Waikiki Aquarium. Plus, it’s close to most hotels on the island and hosts about 350,000 visitors annually. Oahu is the most heavily populated island of Hawaii. So many people associate it with busy shops, bustling nightlight and crowed beaches. Because of this, some travel to the other islands to find a more relaxed type of vacation experience. But many fail to realize that Oahu truly has it all. 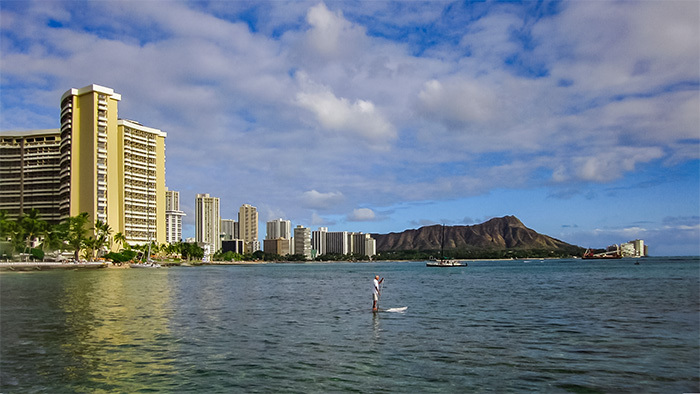 Surfing, snorkeling, swimming and paddleboarding are the go-to activity for visitors on Oahu. The beginning of the Makapu’u Lighthouse Trail. Oahu offers some prime hiking trails to those who like the outdoors. Next to Waikiki is the world famous volcanic cinder cone, Diamond Head. It offers beautiful ocean-view trails within close proximity to where you are probably staying. Enjoy taking in mountains views and waterfalls. You can do this by exploring Manoa Falls in Manoa Valley and Waimea Falls Park on the North Shore. 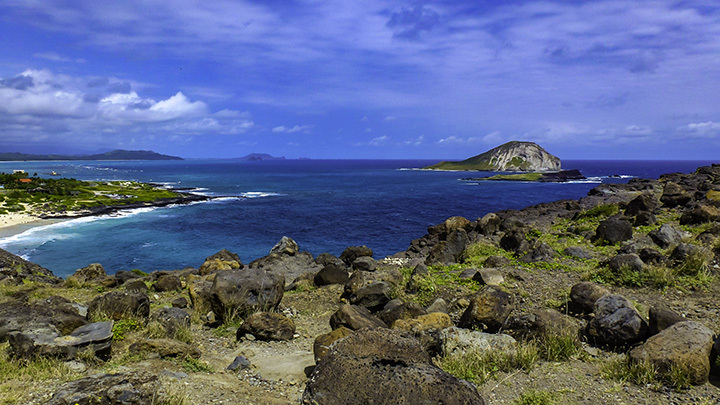 Another famous place to go hiking is the scenic Makapu’u Lighthouse Trail. It features stunning views of the surrounding rugged coastlines and outlying islets.